This is my buyers & sellers guide for the Israel site version of eBay. Get global shipping, english online shopping, find out other sites like eBay in Israel in 2019. With the lack of good equivalents (more on those later), eBay remains highly popular in Jerusalem, Tel Aviv, Haifa, Rishon LeZion and other parts of Israel. 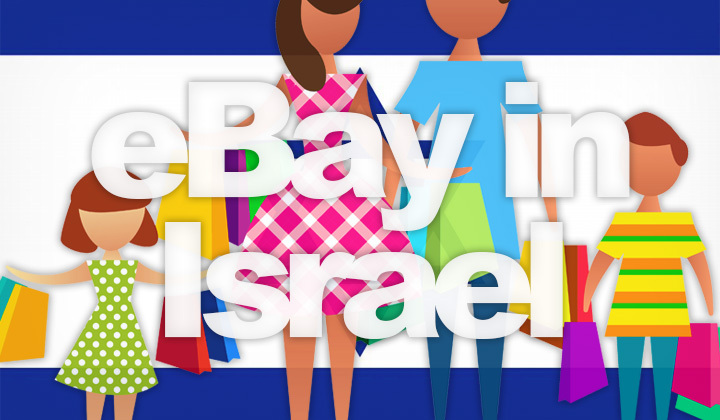 The Israel localized “ebay.co.il” website is simply a guide for seller and buyers to navigate through this global version of eBay, intended for Israelis. It’s a familiar, English language e-commerce portal which also includes sellers from Israel for local shopping. Although most Israelis use the global shipping features, backed up with a buyer protection which makes them a trusted brand. While eBay functionality doesn’t differ, you can use the advanced search features to your advantage to compare pricing and availability globally. Sometimes local sellers are more competitive due to lower shipping costs and possible customs fees, this is not always the case. Step 2. Scroll down on that page until the “Located in” menu. Step 3. Select “Israel” from the list of countries. Step 4. Search for what you’re looking for and results will be narrowed down to sellers in Israel only. There are plenty of available electronic, fashion, books and other items available from local sellers — worth trying out! Step 2. Scroll down until the “from preferred locations” menu. Step 3. Select Asia for example, to search amongst items with highly competitive pricing. Global shipping costs will be estimated automatically. For those wishing to enter the lucrative e-commerce market in Israel and other international destinations, or simply list and auction items there, eBay is the easily the best method with the convenience of English language. You can take advantage of the Global Shipping Program for global shipping methods, and selling features to Israel no matter where you are located. You can only shop in Israeli new sheke (ILS) if you search amongst sellers and eBay stores located within Israel only. Also you will need to manually turn off the “convert prices to U.S. dollars” option. Otherwise default currency is the US Dollar. There is no eBay version available in Hebrew, and neither Arabic. Except ebay.co.il which is nothing but an information site. Not for actual purchases. Custom duties are usually not included in the cost of items, so shoppers carry the responsibility to take this into consideration when ordering items. For global and local shipping costs estimations to calculate automatically, you need to have an IP address and physical internet connection from an Israel location. As previously mentioned, there is little good competition with sites like eBay in Israel. Especially since online buyers are accustomed to e-commerce in English. Yad 2 — Apartments, cars, jobs, second hand. While not exactly an equivalent, this is a site like eBay in the since that it’s for listing used items, somewhat similar to a classifieds sites like Craigslist. The website is very basic, but it’s still a popular place to post your items to be casually sold locally in Jerusalem, Tel Aviv and elsewhere in Israel. Founded in 2005 and has since been bought by a Germany company “Axel”, and now also does job listings. The board remains free for basic users. Established in 2012, this website is both an online trading site, and a product search tool for comparing the prices of hundreds of thousands of products in more than 1,000 online stores. Also users can leave reviews and ratings to products and stores. What is your experience in English shopping in Israel? Questions on the Israeli eBay and how to buy are welcome! This blog aims at transparency towards it’s policies, in which one is the possibility of affiliate links amongst the content posted here. This is to support the costs to run Elftronix, the site and work put behind it. My biggest thanks, David.